Do you remember riding the bus to school? Did you have to take the bus to get around the city when you were a young adult, maybe rode it with your mother to the super market? Chances are you laughed, yelled, held hands with your crush and learned about life along the way. Maybe you only rode a bus for a school field trip but the theme remains, buses bring people together and when you want your closest people around you, there’s no better choice. I’ve been in this industry a long time now and I have to say that restoring antique buses give me the greatest pleasure one could ask for and I’ll tell you why. The reaction people have to them! Everyone experiences them differently but all with the same wide smile and awe filled expression. Much like how you first experienced it thinking to yourself, “Man, That is one awesome ride” is how your guests will also feel. For the grandparents and older generation who experienced these vintage buses in their prime, it brings back beautiful childhood memories of a time forgotten. They remember falling in love, meeting their friends, riding to the baseball game, spending time with people they admired and cared for. For the younger generations, they get to see a blast from the past and experience it in a brand new way. Whether for a wedding transportation where love and happiness is in the air or at a sporting event where camaraderie is the theme, they will forever carry on the great memories and associate it with that unique bus ride experience. Me and my family/teamates here at Low Country Valet get it, which is why we put so much effort into saving these pieces of history. It is our passion to provide this type of experience that is why we meticulous maintain our fleet which includes our eye-catching 1950’s Crown Supercoach lineup, each being able to carry up to 60 passengers. In addition to the Supercoach line up, we also feature a classic Greyhound Silverside from the ‘40s, a General Motors bus from the 50s and and a 45-passenger GM Bus from 1966, but that’s not all! We’ve got plenty of amazing vintage car options available to suit your needs, ranging from the ’40s to the ‘60s. These stylish vehicles ensure a safe, comfortable ride, plus they allow you and your fellow passengers to really make a statement wherever you go! You’ve seen them cruising down the highway, and you’ve probably noticed the passengers inside looking pretty content and comfortable: modern coach buses represent today’s standard for transportation when lots of people are involved. These modern machines can fit dozens of passengers, making them perfect for trips to big parties or sporting events. They’re even ideal for wedding transportation if you need to get a lot of people to the same place in safety and style. 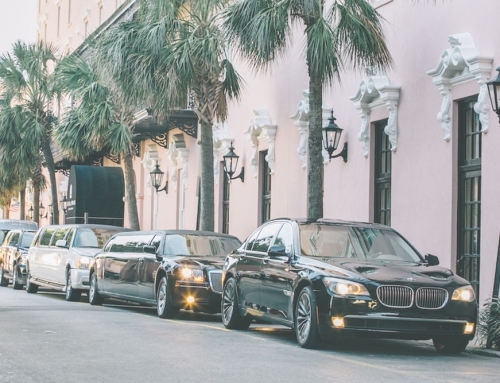 Low Country Valet recognizes the appeal of these amazing motor coaches, and we have a full selection to choose from, including 32, 38, 49 and 54-passenger models. We also have a modern 27-passenger executive limo coach available for those times when you don’t want to stop entertaining just because you’re on the road! Do you have an upcoming event or group getaway that would benefit from a bus? We encourage you to give us a call today to learn how you can reserve one of the tremendous models in our vast fleet. Dial (843) 810-0107 to find out more information — our transportation experts are ready to help you find the ideal vehicle.